BIZstream Health complements the core business of a hospital by creating a technological environment to provide education, information and entertainment for patients, their guests and your staff during the healing process of each patient as well as to help patients to be actively involved. Medical centers and hospitals are centers of education and BIZstream Health is designed to facilitate knowledge sharing among the members of your Health community. Your staff can produce educational videos, record and archive procedures and operations for training and as reference for the future, provide video on demand services for the patients to understand and acknowledge their treatment and share the latest medical news from accredited sources. At the same time you can inform patients and their guests about the hospital, your services, thestaff and your areas of expertise through any TV, mobile device or digital signage monitor. BIZstream Health brings the full portfolio of luxury entertainment services from 5- star luxury hotels to your patients and their guests. Provide unlimited number of channels in HD and 3D quality directly to bedside terminals, patient’s in-room TVs or guest mobile devices.A huge variety of Video on Demand content with first run and award winning movies, time shifted TV as well as the capability to record any TV program to view anytime. 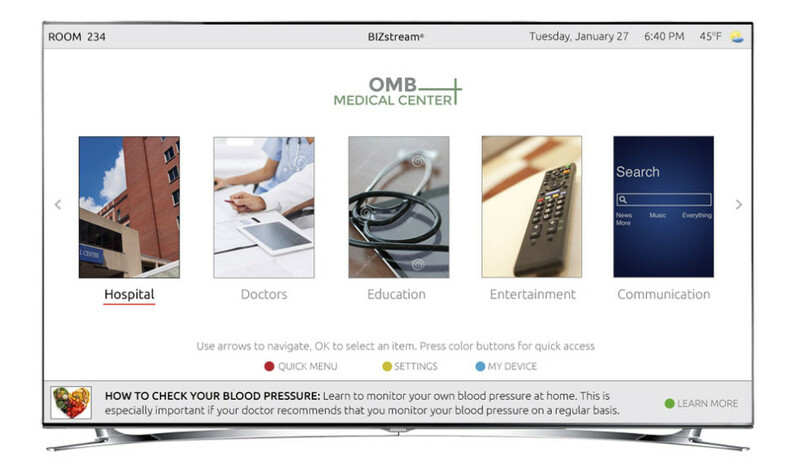 Over and above, BIZstream Health also supports screen sharing for mobile devices, allowing patients and their guest to share their own content from their personal devices with their in-room TV without any cables or additional equipment. Recovery can be faster when patients are actively participating in their treatment. BIZstream Health provides the means to bring patients closer to your staff and make them actively involved by providing unique and personalized patient services such as treatment schedules, reminders, messages, personal treatment exercises and daily goals to achieve, educational material, interactive access to information and training material, surveys, Q&A service and more. BIZstream Health is designed to address personalized choices and needs by respecting the uniqueness of each patient. The user interface on any TV or mobile device can be customized by the patient or by your staff to create a personalized, thus comfortable, experience. Educational and entertainment content can be tailor made for each patient while in addition you can provide some extra services when this is permitted by the treatment: selection of meals, ordering for therapeutical massage or any add-on service that you can upsell and will make each patient more comfortable during the treatment. BIZstream Health is much more than a patient-facing / guest-facing solution. It is a unique interface that provides a uniform user experience across all screens in a medical center or hospital and is already integrated with the majority of the hospitality solutions available in every Health center: bedside terminals, various HIS and nurse call systems, pillow speakers, building management and room control systems, alerting services, fire alarm, housekeeping, monitoring, digital signage solutions and more. Is it all about caring! We complement our BIZstream Health services with multilevel support services to achieve the best possible support and maintenance for all our installed solutions. All BIZstream Health installations are based on 2-server architecture with the servers configured for load balancing and 1-to-1 redundancy to achieve zero down time. At the same time, each installation is closely monitored end-to-end sending alerts with detailed descriptions to MCOMS NOC and your IT team. We monitor all critical points of the installed system including the network, servers, gateways and more. For support, MCOMS provides 24×7 call center as well as a NOC in our premises for full remote support.